On October 10, 2010, The Journal of the American Medical Association, one of our most prestigious medical journals, published a paper on an 11 year follow-up of women who took part in the Women’sHealth Initiative Study. You may remember this was a study of women who were taking hormone replacement therapy using Premarin and a synthetic progestin. The study was cut short when it was found that women on Premarin and progestin had an increased incidence of breast cancer but also heart disease. Based upon this study the use of HRT dropped significantly. But it did not take long before the FDA allowed Premarin (pregnant mares urine derived estrogen) to be back on the market with a new warning label that said Premarin reduces only the incidence of osteoporosis. Doctors are still prescribing and women are still taking Premarin. Now the JAMA article followed up this population of women who were on Premarin with a synthetic progestin after 11 years and the findings are even more ominous. 1. After 11 years since last being on Premarin and synthetic progesterone, incidence of Breast Cancer was greater than in controls. 2. Women were more apt to have metastasized. 3. Not only was occurrence of Breast Cancer greater but more women died from the disease than the control population who never took hormone replacement. We often hear or read on and in the written media, when breakthrough medical research is reported. Not this time. The information remained buried. This alert is a wake-up call to all of my female patients..
STOP USING NON-BIOIDENTICAL ESTROGEN AND SYNTHETIC PROGESTERONE. You do not have to dry up and age but can safely and effectively take bioidentical estrogen and progesterone. Nature cannot be fooled. It knows the difference between what is man-made and what our body naturally makes. 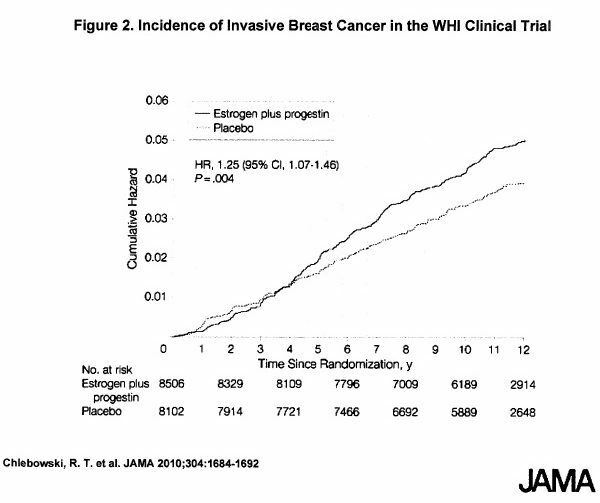 Look at Figure 2 from the JAMA article Estrogen plus progestin and breast cancer incidence and mortality in postmenopausal women. What you see is even after eleven years of being off Premarin the incidence of Breast Cancer gets even greater. I have written before about the importance of natural hormone therapy in my alert titled “Progesterone and Estrogen Balancing” I have quoted Dr. Nelson cited in Suzanne Somers’ book when he said “I have never seen a woman with high levels of Progesterone who ever developed Breast Cancer. Not one.” The incidence of Breast Cancer increases with age so that if you live to age 90 your risk becomes one in seven. This is because once you stop ovulating you no longer make Progesterone. But you will always be Estrogen dominant as your fat cells continue to store and make Estrogen. Unless you are taking supplementary natural Progesterone you will ALWAYS be Estrogen dominant and at increased risk of Breast Cancer. If you don’t believe this, test your saliva, it is the only accurate way to test for levels of bio available Progesterone. Also taking Progesterone as a transdermal cream is also the best and most efficient way to replace this hormone. The panel will also measure your Estrogen, Testosterone, DHEA and Cortisol levels. If your Estrogen is low you can safely replace it with the bioidentical human estrogen in a ration of 80 or 90% Estriol, the anti-cancer Estrogen, and 20 or 10% Estradiol. A woman’s brain requires Estrogen to protect her neurocognition and from aging. We have set up the Center for Women’s Health at COEM in order to provide you with the best care and information. We are the only facility in South Carolina to offer Breast Thermography and a comprehensive Breast Health Program. We can do comprehensive hormone analyses and hormone balancing.